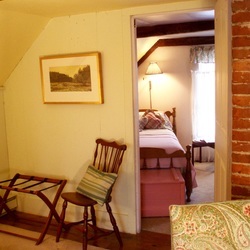 Our five individually decorated guest rooms come with private baths and wonderful water views. 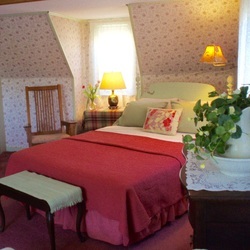 Fresh flowers, and a good nights sleep await your arrival and a full country breakfast starts your day. 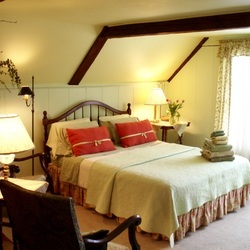 This charming suite features a queen size bed for the couple visiting, with the advantage of an attached room for those traveling with family. The bathroom is across the hall, reserved for this room only. A spectacular view of the pond, may see herons or eagles fly passed. 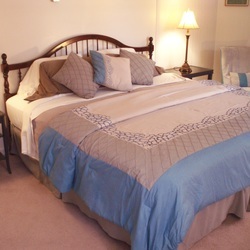 A queen size bed with a dressing area also connects an additional room with two twin beds, and the bathroom is ensuite. 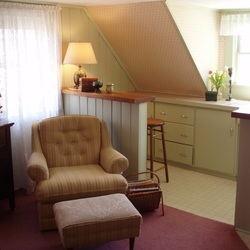 For the summer this room offers air conditioning. Our breeziest room, featuring windows on three sides including a pond view. 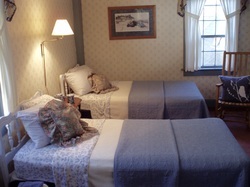 Room features a queen size bed, comfortable sitting area, and a refrigerator, and eat-in bar convenient for longer stays. The bathroom for this room is ensuite. 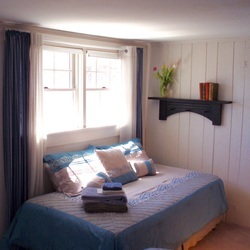 A sunny room with a great view of the pond and a king size bed. There is a comfortable chair, ottoman, and a desk. 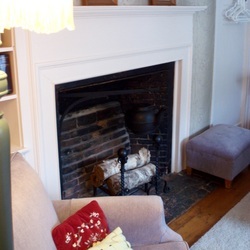 The fireplace is original to this 1780 Colonial. Private bathroom ensuite. 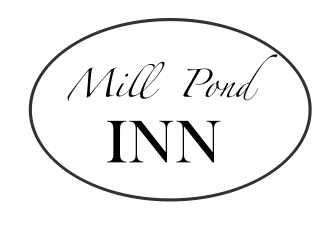 A spacious room with a wonderful view of the pond with a king and twin size bed in the room, offers a private bathroom across the hall for this room only. Perfect for friends, or a small family traveling. 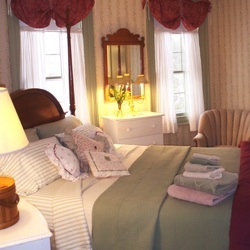 All rooms provide complimentary scented rose water-glycerine soaps, fresh flowers, and thirsty towels. Fans are provided in all the rooms. Glassware, corkscrews, and ice buckets are available upon request. Free Wi-Fi available in all guest rooms. Payment of first night's deposit is required. Traveler's and personal checks and cash accepted; sorry, no credit cards. All rates are subject to tax. Check-in after 2pm, Check-out at 11am. ﻿Restrictions: No pets. Smoking is limited to outside only. Children over 10 years old welcome.